Saints: Foden; Wilson, G Pisi, Mallinder, North; Myler, Dickson; A Waller, Haywood, Brookes; Lawes, Day; Wood (c), Clark, Picamoles. Replacements: Hartley, E Waller, Hill, Paterson, Gibson, Kessell, Tuala, Hutchinson. Gloucester: Hook; Sharples, Scott, Atkinson, May; Twelvetrees, Laidlaw (c); McAllister, Hibbard, Afoa; Savage, Galarza; Moriarty, Rowan, Morgan. Replacements: Matu’u, Orr, Ma’afu, Latta, Kvesic, Heinz, Burns, Purdy. Tom’s preview: Much of the talk at Franklin’s Gardens this week has been about putting an end to a vicious cycle. The ‘lose, react’ pattern, as Ethan Waller described it, has been haunting Saints during a disappointing start to the season. But on Halloween weekend, they will want it to continue for just one match. Because Saints, who have won just three of their eight matches in all competitions, desperately need to react to what happened in the Stade Pierre Antoine sunshine last weekend. Jim Mallinder’s men were eviscerated by a fired-up Castres team who came into the match on the back of a big beating at Leinster a week earlier. 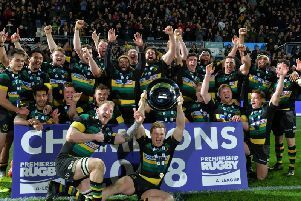 That clearly spurred them on, while Saints, who had edged past a monstrous Montpellier side on the same weekend, didn’t have the same vim and vigour. In fact, they had none of it, slumping to a 41-7 defeat. Skipper Tom Wood said he was ashamed to admit that his team lacked energy. He said he could tell as early as the opening 20 minutes that Saints weren’t in the game. And he said that he was wishing for the final whistle with 20 minutes remaining. It was a horror show from a Saints team who simply didn’t turn up. But now they need to banish those demons in a big way. A defeat against Gloucester this week would turn a poor start into a shocking one. And with two Anglo-Welsh Cup weeks to follow, it would continue to play on their minds for some time. Saints have traditionally been able to turn things around quickly after big disappointments in recent years. They lost 25-6 at home to Ulster in December, 2012 before rolling up their sleeves and winning in Belfast on the following weekend. And a year later, after being pummelled 40-7 by Leinster at the Gardens, Saints marched into the Aviva Stadium and turned the tables, winning 18-9. Bouncing back is what they do, but if they can do it this weekend, they will not want to have to do it again for a while. They are craving consistency that would lift them from their lowly ninth position in the Premiership table. And with the fixtures looking slightly more favourable in the weeks to come, they could start to find form. But no game appears easy right now, with every hurdle looking like a mountain. And Saints need to scale one on Friday night to ensure their season starts to go in the right direction once again.